Sherry’s blogiversary party game for today is “Truth or Dare”. She told a wonderful story about “streaking” with some friends in 1974 and how she was spotted by both a police officer and a house full of nuns. I remember hearing this story as her younger sister and thinking she was fabulous to do that. I still admire that about her. 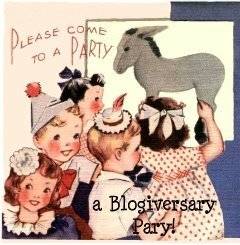 To hear more of the story, click on the blogiversary invite in my sidebar. Sherry has asked her party guests to share a daring story on their blog. After reading her great story, I thought, “I will skip on this game because honestly, I am not a daring person.” However, after a little more thought, I think I am. ~I dared to quit my teaching job of seven years when my daughter was born. I wanted to be home with Alexander and Sophia but it was scary to totally rely on Steve for 100% of our income. Not that I have ever doubted his abilities, but I had worked hard to obtain my teaching job that I loved and I felt very independent knowing I was contributing to our family income. ~My family has always been my main source of friendship and to leave them and move 700 miles away to a place where we knew absolutely nobody was a scary adventure for me. To add to it, Alexander was two years old and Sophia was only four weeks old when we left Kansas. ~I chose to let my children wean naturally from the breast and to tandum nurse. I had no other role models to follow after but just knew it was right for us. ~I dared to unschool my children which means I have put total trust in them that with the guidance and support of Steve and myself, they will learn all they need to learn in life by following their passions. So far I haven’t been disappointed! ~I dared to bring home a border collie as our first ever dog. From what our dog trainers have told us, border collies are one of the most difficult dogs to own because they are so smart. However, she and all of her energy has turned out to be a wonderful addition to our family. ~I dared to go off all medication when everything I read online and everything my rheumatologist told me said it can’t be done. I was told I would be on heavy medication for life. It hasn’t been easy, but I am going on seven months of being medication free and one month without any pain or swelling! ~I dared to go back to my natural hair color and expose all my gray hairs in a society that values youth and perfection rather than the beauty of aging and all the imperfections that come with it. So, I don’t have any flashy, fun, daring stories to share, but I do feel proud of the “daring” things I have done to bring me where I am today. What about you? Any great “dare” stories? You are QUITE a daring woman! Thanks for stopping by my blog – I’ll have to add you to my roll. 🙂 I always love to hear from other unschoolers!